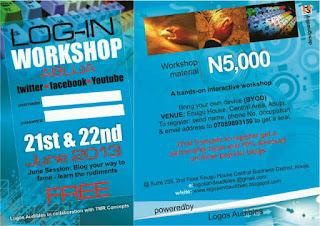 Abuja LOG-IN 2013: Intending Bloggers Workshop Debuts in Abuja. Intending Abuja bloggers are you ready?? good times are here again. Logos Audibles Ent. debuts the maiden edition of a two day Abuja LOG-IN Workshop for intending bloggers and bloggers who want to learn the rudiments of great blogging career. 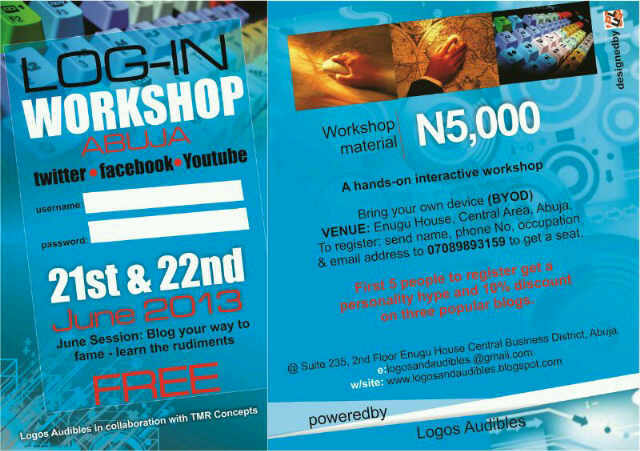 Taking place on the 21st and 22nd of June, 2013 at Enugu House, Central Area Abuja. From blog set up, design, customization and traffic generation (wow!! so cool). I also heard the workshop will feature even more. Participants will learn how to "Blog" interactively to fame!! Account Name: Logos Audibles Ent.